Otto Ege identifies this leaf as coming from a Psalter made in France in the late fourteenth century, but it seems more likely to have come from a Book of Hours. One reason for this suspicion is that some of the leaves from this manuscript contain text in French--this is one of only a few manuscripts in the Ege portfolio not entirely in Latin. The vellum measures 18 x 12 cm and is thick and dirty (Ege speculates it may have been exposed to dampness); it has been cut or torn across the top edge. The lining is done in ink, with the primary text in brown and blue, orange, and white in the decoration. There are large illuminated initials with painted blocks. In the left margin on both sides is a large gold and blue bar with pointed ivy, and the decoration bleeds through to the opposite side of the leaf. See Denison University Leaf 25 for more information about this manuscript. 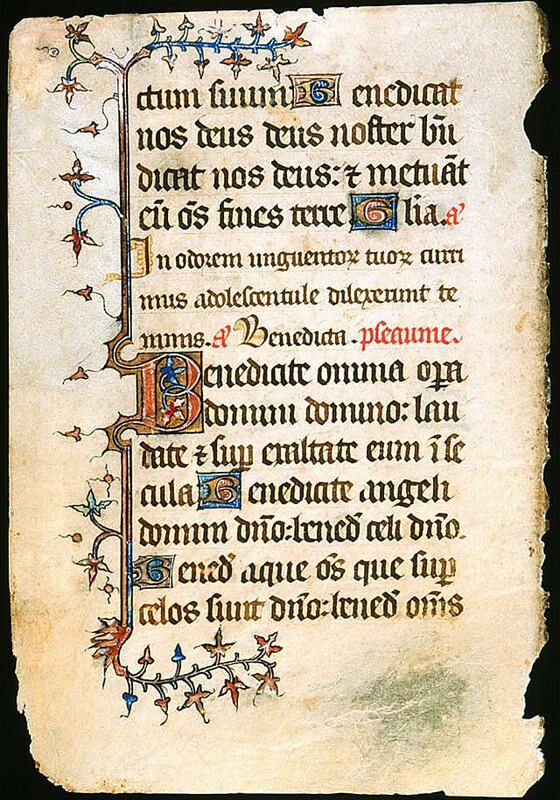 Text: The Hours of the Virgin at Lauds, including text from Psalms 66 and Daniel 3 (verso). A scan of the recto is not currently available. -ctum suum. Benedícat nos Deus, Deus noster! Benedícat nos Deus, et métuant eum omnes fines terræ. Gloria. Ant. In odorem unguentorum tuorum currimus adolescentule dilexerunt te nimis. Ant. Benedicta. Pseaume. [Psalms 66] ...her fruit. God our God bless us, God bless us: and let all the ends of the earth fear him. Glory be to the father. Ant. Into the odor of thy ointments we do run: young maidens have loved thee exceedingly. Ant: Thou daughter art blessed.